The fuel spilled from a trailer that fire officials say contained nine 55-gallon drums of diesel. Firefighters found the trailer parked on the side of a road near Highway 246 around 8:20 a.m.
One of the drums was empty, and it appeared to have leaked onto the road and into a storm drain that leads to the Santa Ynez River. 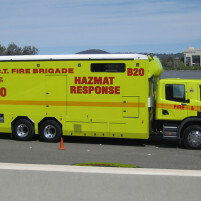 A hazmat unit responded to clean up the spill. Investigators say the fuel was likely stolen from an agricultural or industrial site. The diesel was worth approximately $1,800. Surveillance footage shows the driver of a light-colored Chevrolet abandoning the trailer after examining the leaking barrels. Sheriff’s officials say the trailer is unregistered, and the suspect drove south into Buelton from Highway 101 around 12:15 a.m. on Friday. Investigators have requested that anyone who stores large quantities of red diesel to check their inventory. Anyone who has information about the case is asked to call the Santa Barbara County Sheriff’s Office at (805) 683-2724. Wow! “Dozens of gallons”, this is an incredible environmental disaster beyond belief. Talk about capitalizing on the recent oil spill at Refugio just to make headlines. Somehow, somebody will make this the fault of the greedy oil companies.